I'm catching up so that I can get ahead. Yes. That's the plan! Some critics have hailed this title as Wodehouse's finest. That's not why I read it. I read it because it was the Jeeves & Wooster title on my shelf which I had not read. And I think you'll find reasons to quibble about which Wodehouse work is his best as everyone seems to enjoy a different character or storyline. The one thing most people tend to agree on is that Wodehouse must be read because his writing is delightful. I think this is true. If you didn't read along with the book club this past month, I hope you'll make time for a Wodehouse at some point. I can't imagine you'll regret it. 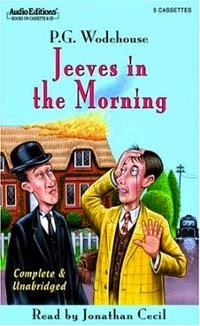 In Joy in the Morning characters Bertie Wooster and his servant Jeeves are being called to Steeple Bumphleigh, a country village where Bertie has no desire to go. His Aunt Agatha lives in Steeple Bumpleigh and he does not like his Aunt Agatha and makes objections to the visit. However, Jeeves' logic persuades Bertie that he has a duty to travel to Steeple Bumpleigh and assist his uncle in arranging a secret business meeting. Bertie is cheered to discover that his aunt will be out of town and so off to Steeple Bumpleigh he and Jeeves go. Of course, as is the usual for Bertie, he runs into a female (in this case, an old flame) who wants to marry him but whom he has no wish to marry. Romances are falling apart everywhere and growing in places that no one wants. Life becomes a complicated mess and it is Jeeves - and only Jeeves - who can apply some thought and logic to bring about happy resolutions to everyone's problems. Jeeves is the hero and Bertie is appreciative. Even if this particular story about Wooster and Jeeves sounds similar to others, you don't mind reading about the particulars in this one because Wodehouse has a delightful way of turning a phrase in order to make the reader laugh. "you were saying you made a bloomer in trying to be bright and genial." Wodehouse wrote this particular title when he was living in Germany. If you are unfamiliar with the person Wodehouse, he has a rather fascinating history. He was born in England and all of his books have a very British feel to them. However, most of his adult life was spent outside of England. Shortly before the second world war, Wodehouse moved to France to escape double taxation on his earnings from England the U.S. Of course, Germany occupied France and Wodehouse was interned by Germany for the remainder of the war. What was likely a poor choice on Wodehouse's part was that he prepared and delivered five radio addresses during his time in Germany which caused his countrymen to distrust his loyalties. Wodehouse rather severely underestimated the British mindset towards Germany. He never did seem to realize or understand why Britains were displeased with him for his radio broadcasts which apparently made him sound too jovial and friendly towards the Germans. As a result of this kerfuffle, Wodehouse never again returned to England. After the war, he and his wife moved to New York where he lived until his death in 1975. Despite the fact that Britain was less than pleased with Wodehouse immediately following the war, he was eventually knighted. In an interview he gave later in his life he said he had no further ambitions after he had been knighted and had his likeness made into a wax figure at Madame Tussauds. Would that we could all say that of ourselves, hmm? Wodehouse tickles my funny bone. I've not read a biography (all info about him gleaned from various online sources) but I would be very curious to do so. I imagine it would be fascinating! Again, if you haven't read anything by him yet - do! I'm glad to have had an opportunity to visit with his most famous characters again. It was reading time well spent! I am unfamiliar with the person of Wodehouse - and find it tremendously interesting that he spent most of his life outside of Britain. I don't know that I've read this particular book, but Jeeves and Wooster are always fun! I don't recall overly liking the first Wodehouse book I read, but I kept wanting to give him another try. I've been listening to Right On, Jeeves(I think that's the title) and I have adored it! I've laughed so much! Now I want to read more. I didn't know that about Wodehouse's history. That's me take on everything of his I have read so far: the plot lines seem similar and aren't what I'd call brilliant, but the writing itself is delightful. I'm so glad you enjoyed the book! I don't know anything about Wodehouse as a person, just that I love reading his books.